Tony D's sells quality used cars, at the low prices you are looking for! With vehicles starting as low as $2,495.00, you'll be sure to find your next ride at the price you want to pay. We work hard to find the best deals for price, gas mileage and condition. Most vehicles have only had a single owner!!! Come see our selection at 308 Dartmouth Street, in New Bedford MA, or call us at 508-984-4900. We know we can find the right car for you! 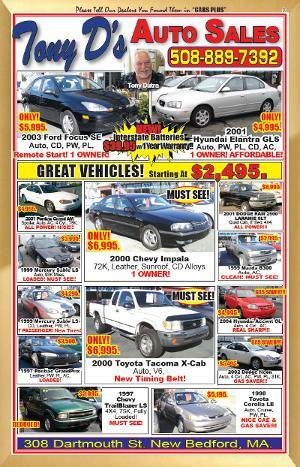 Check out our ad in Cars Plus magazine to see our current deals and new arrivals. Car Plus magazine can be found in stores across southeastern New England.